What is dav file? How to open dav files? The dav file extension is mostly known to be used for a special video format from several digital video recorders (for example DVR365, DVR-1600HP, etc.) as well as CCTV security solutions from several different manufacturers, including DVR365, AlienDVR or Mace. 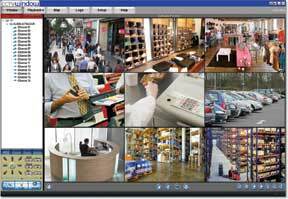 The dav file represents video recording in a specially modified version o MPEG format saved in the SightBoss Central Station software which is installed on the DVR. These dav files are also encrypted so they cannot be played by standard media players with MPEG support. A special playback software (DVR365) is needed to view the footage. You may also need older MPEG codecs installed on your computer for the playback to work. Note: It seems that the DVR365 family of video recorders was superseded by AlienDVR devices that offer better resolutions and video encoded using the H.264 codec. The latest AlienDVR video recorders do not use the original DAV format and it appears the recordings no longer even use the dav file extension as well, but the standard mp4 or 264 suffix. DVR365 PC Player is special software, which has been developed so that a video file/clip can be taken from the DVR and put onto a CD or similar so it can then be played back on a stand-alone PC elsewhere. CCTVWindows is client software for Windows PCs suitable for controlling and monitoring multiple alienDVRs and alienIP cameras over the LAN or Internet. The official DVR365 Player software allows for playback of .dav recordings. Standard media players won't work. You can find special utilities that allow for conversion of DAV format to AVI, for example the small utilities from Bahamas Security. and possible program actions that can be done with the file: like open dav file, edit dav file, convert dav file, view dav file, play dav file etc. (if exist software for corresponding action in File-Extensions.org's database). Click on the tab below to simply browse between the application actions, to quickly get a list of recommended software, which is able to perform the specified software action, such as opening, editing or converting dav files. Programs supporting the exension dav on the main platforms Windows, Mac, Linux or mobile. Click on the link to get more information about listed programs for play dav file action. Programs supporting the exension dav on the main platforms Windows, Mac, Linux or mobile. Click on the link to get more information about CCTVWindows for record dav file action. Programs supporting the exension dav on the main platforms Windows, Mac, Linux or mobile. Click on the link to get more information about listed programs for import dav file action.